First ever OOTD! I’m not going to lie, posing for these pictures was pretty awkward. I’ve never been very good at those ‘candid’ shots. ANYWAY. A few days ago I was approached by a brand called Boutique of Molly; they asked if I would like to review a few of their products and after looking at their shop (which you can find HERE) I could not say no! The first of two items I’ll review for you today is this dress, which I am completely in love with. All items will be linked below. It is as comfortable as it is beautiful. One thing I’ve found with bardot style items is they can sometimes be uncomfortably tight, but this isn’t the case with this dress at all. 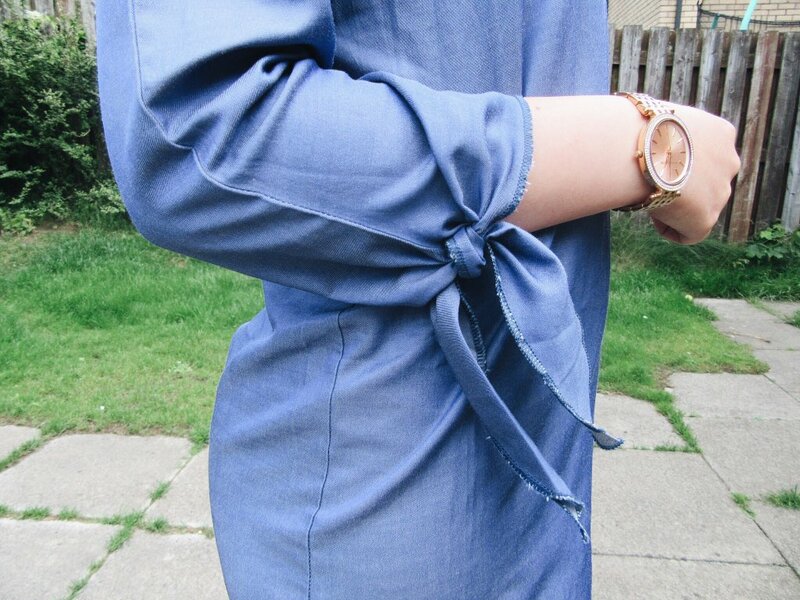 It’s so comfy to wear and easy to style given the blue colour of it. I thought it woulg be more denim-y than it is, it’s actually super soft and lightweight – perfect for summer! It’s also extremely good quality at an affordable price and the delivery is SO quick. If you order before 3pm your order is likely to be delivered the next day! I also find it to be very orignal – I’ve not seen anything like it! But then again, I do have to delete all the shopping apps I have from my phone to stop me spending money so I don’t really know what’s new in at most shops right now. That said, look at those sleeves!! They are definitely my favourite part of this dress. They add something a little different to a simple dress. I’ve styled it really casually today, pairing it with a pair of pointed ASOS pumps and some jewellery. I feel like this dress could also be dressed up with a dark lip and some black heeled ankle boots. Go check out their shop! I can guarantee you will fall in love with their items. They have some very original pieces that can be styled up or down and I think I will definitely be purchasing from there again!